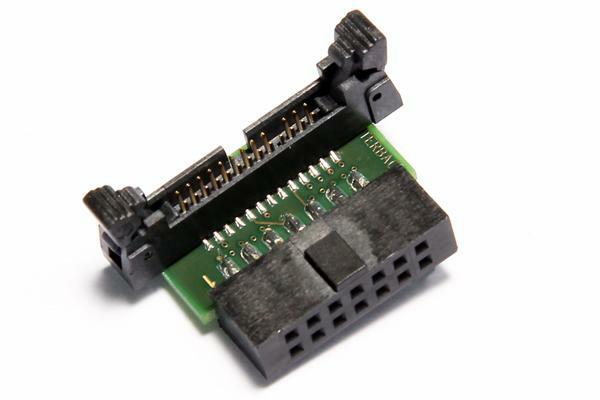 This is a standard 14 pin double row (two rows of seven pins) connector (pin to pin spacing: 2.54mm/0.100"). The RDY- signal (pin 13) is optional. If the signal is not available, or can not be connected because of other reasons, the RDY- pin on the debug connector should be connected to GND. If the RDY- signal on the debug connector is not connected, set SYStem.Option.NOJTAGRDY ON. EVTI (pin 7) is optional. If connected, it can be used to halt the core on external events. If the signal JCOMP (pin 14) is not available on the used processor/package type, leave the JCOMP pin on the debug connector unconnected. If JCOMP is available on the processor package, it must be connected to the debug connector.